Most people think of Amazon as an e-commerce site where you buy books. But, actually, they are a major player in (1) retailing, (2) e-commerce development (3) inventory outsourcing, (4) advertising, and (5) IT hosting. What can we learn from Amazon? Plenty. 1. Over the last few years, we watched as Amazon moved from online bookstore to online e-book, Kindle and Kindle Fire tablet seller. That was a great move and a logical one, given what happened to the music industry. Lesson One: You must evolve your product even if it cannibalizes your current product. (If you don’t, someone else will.) 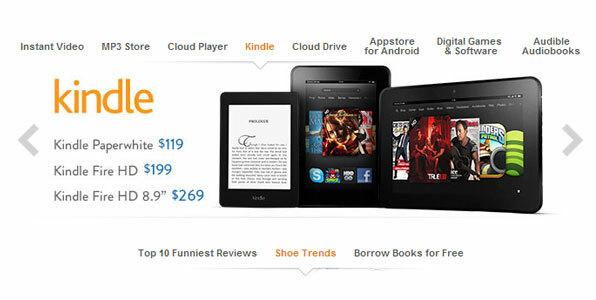 Now the Kindle Fire launches them into the tablet market. 2. As logical as the e-book extension way, so was their business extension into consumer goods. If people come to your site to look for books, why not add more products to the drop down list? Lesson Two: leverage your brand recognition, traffic stream, reputation and skill sets based on your selling model. Amazon realized they were not in the book business but, rather, the online retailing business. Borders and Barnes & Nobles were way late to that party. 3. With their huge inventory of products, it’s only logical to want to advertise those product. But the more products you have the bigger your marketing budget has to be, right? Apparently not. Amazon crowd-sources some of their marketing, letting bloggers and website owners recommend products and link the reader directly to Amazon or display banner ads for a small cut of the revenues. Lesson Three: Your customers are an asset; let them help you. This concept borders on genius to those who do not spend 8-hours a day online. This concept is evidence of a complete immersion in Web 2.0 and social media. Basically, its the Google and Facebook model, but at the the personal website level. It leverages your customer-base, using the latest social media concepts and technology. 4. Amazon also provides a e-commerce solutions through their Webstore for anyone who wants to be an e-tailer. They offer everything from website design to hosting, shopping cards, credit card processing and inventory management. Again, they are leveraging their core competences and staying at the fore-front of the e-commerce tidal wave. Lesson Four: White label your technology to smaller companies. 5. All of these Amazon services require computer storage and CPU. And when you are good at hosting and managing websites, what do you do? Make hosting and managing applications a business line, too. In fact, Amazon Web Service is one large provider of cloud computing services. They provide hosting for Hoot Suite, TMZ, Farmville and many, many others. Now, if they can get Kindle Fire users to store their music in the cloud, think of the growth. Lesson Five: If you have to do the work anyway, do it for others, too, and charge them. But Amazon is very unusual in that each component in its supply chain–from marketing to technology to customer service to operations–does double duty as a product. Every department is expert enough at what it does to sell its services outside the company. And that’s a strategic marketing plan few companies can achieve. If you were Jeff Bezos, what would be your next strategic move?